There are many schools of painting. Why should there not be many schools of photographic art? There is hardly a right and a wrong in these matters, but there is truth, and that should form the basis of all works of art. Whether a watercolor is inferior to an oil [painting], or whether a drawing, an etching, or a photograph is not as important as either, is inconsequent. To have to despise something in order to respect something else is a sign of impotence. Photography hasnt always been considered an art. In early days, photographs were considered an advance of science, not art. Cameras were machines, and everyone knew that machines didnt make art; people made art. But when Alfred Stieglitz made this picture he was leading a movement called Pictorialism, which promoted the photograph as art, the same kind of art as a drawing or painting. Stieglitz and other Pictorialists understood that a photograph was created when the camera was used as a tool, like a paintbrush was a tool. And they tried to show that they were a part of the art tradition by manipulating their photos in the darkroom, using tricks and techniques that were evidence of the human hand in the process. Given that history, the title of this photo has two meanings. The steam engine was a human invention that had huge impact  not all of it good  on the landscape and on peoples lives. And this photograph was made by the hand of man, no mistake about it. The soft-focus effects and the romantic atmosphere were the results of handwork on the print after the film came out of the camera. There are other references to the world of art in this photograph. Stieglitz was very involved in the modern art scene and had closely followed the Impressionist movement in Europe. Impressionists were some of the first artists to look to the city as a worthy subject for their paintings, and it was a new city they looked at. Machines and all things modern in the city were desirable subjects. At the same time, Impressionists represented these modern scenes in stop-motion glimpses, with plenty of atmosphere. European painters chose the steam engine as a subject and a symbol of the modern city. 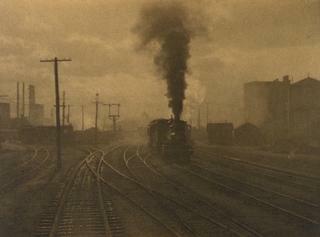 Stieglitz would embrace the city as his subject too, but he would use photography as his medium. Alfred Stieglitz was always interested in photography as an art form. He was also interested in the technical boundaries of photography. 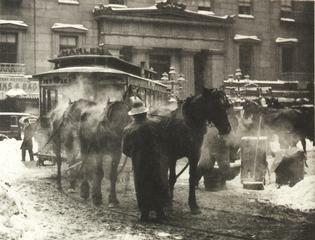 This picture is one of his early experiments in stopping motion, in this case the motion of a horse-drawn carriage and the wind-whipped snow. Stieglitz stood for three hours in a driving blizzard to get this picture, waiting for something picturesque to come moving through the storm. 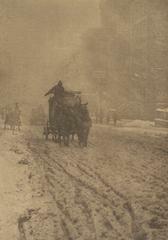 The snow was a critical aspect, for this picture was also a Stieglitz experiment in atmosphere. 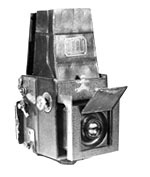 Rather than use a special soft-focus lens (called a Lens of Atmosphere in advertisements), Stieglitz wanted to take straight, hand-held detective camera photos of real, observed moments. He needed naturally-occuring atmosphere to create a mood, situating his pictures squarely in the realm of the art world. Weather provided the atmosphere, the fuzzy, soft-focus effects that could double as brushstrokes. Weather could be means to his artistic ends and Stieglitz would turn to it again and again. What Makes This Photo Pictorial? When Stieglitz took this picture in 1892 he was interested in pictorial photography, a style of picture-making that was meant to put photography on the same level as other art forms, such as painting and sculpture. For Pictorialist photographers, the everyday scenes in front of their cameras were not by themselves subjects for great art; the photographers needed to shape the picture to express their own artistry. 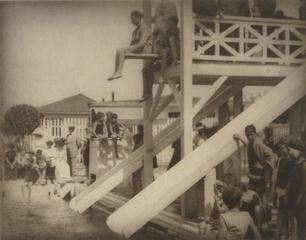 Photographers used many devices to shape a photograph, and there were a few elements that applied to most turn-of-the-century pictorial photographs, including this one. Click on the diagram bar above to find out what makes this photo Pictorial. 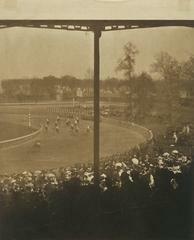 The racetrack was a place to see and be seen by the upper middle class when Alfred Stieglitz took this picture in 1904. The real subject of this photo, however, is the formal relationships of the curving track, the horizon line, and ceiling and pillars in front of them. Stieglitz, a fan of all things modern and tuned into modern art movements in Europe, used architectural elements to carve up space in this picture  a very modern idea indeed. The big, abstract shapes that result fit together like pieces of a puzzle. Modern painting at the turn of the century had begun to record the painter's physical, intellectual and emotional experience of things. As far as Stieglitz was concerned if painting was no longer limited to subjects like nature, religion, love and war, then photography would not be limited either. Now a painting, a photograph, and all art forms, could capture the vital essence of the modern world by reflecting the personal vision of the artist. The atmosphere of his earlier pictorial work is still here, but in this picture there's also a hint of modern things to come for Stieglitz. Alfred Stieglitz said the Flat-iron building appeared to be moving toward me like the bow of a monster steamera picture of a new America still in the making. (American Visions, Robert Hughes, 1997) For New Yorkers the Fuller building, nicknamed the Flat-iron because of its shape, was a symbol of a new, modern America. People either loved it or hated it. Contrasted with the natural shape of the tree and bathed in snow and evening light, the building is an element of quiet beauty in a photograph of soft tones and simple shapes. The building and the tree form silhouettes, like cut-outs overlapping one on top of the other. This flattening of space comes from the influence of Japanese wood-block prints that were all the rage with modern artists of the time. Other clues that point to the influence of Japanese prints are the crescent of snow in the crook of the tree (the same tone as the building), and the tiny figure on the park bench. Humans were often dwarfed by mountains and rocks in Japanese prints; in New York, buildings do the job of making people seem tiny. 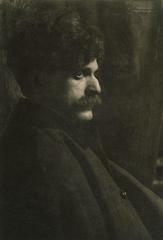 Stieglitz argued that photographers dealt with the same concerns that modern painters considered. Translating the influence of Japanese prints from painting and printmaking to photography was both a modern and an artistic thing to do. The Deal in the title of this picture refers to Deal, New Jersey, where Alfred Stieglitz took the picture. No longer concerned with photographs that looked like paintings, Stieglitz now emphasized modern art and photographs that looked like the work of a camera rather than a paintbrush. Creative photographs, according to Stieglitz, should be photographic. Everyday subjects came into sharp focus in Stieglitzs lens, preventing viewers from escaping into romantic images of life. No more soft, misty effects, contrast was now useful. A full tonal range of blacks and whites is evident in this print, unmistakably made by a camera. Stieglitz still thought of the photograph as an avenue of expression, an idea he had fully developed with the Pictorialists. Now, however, he added concerns of modern art like line, shape and balance. This photography was really about photography. 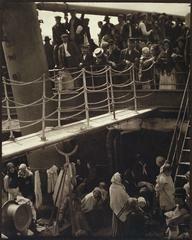 Lots of photos and background on Stieglitz as a photographer. A biography of Stieglitz with big reproductions of selected photographs. Photographs that appeared in all 50 issues of Camera Work plus an introductory essay. Selected photos and articles that originally appeared in Camera Work, an introductory essay and indexes of all articles and photographs that appeared in all 50 issues. ArtsConnectEd is a collaboration between The Minneapolis Institute of Arts and the Walker Art Center which provides online access to the rich collections and reference, archive, media, and curriculum resources of both institutions. An overview of the work of Berenice Abbott shown through photographs selected by Berenice Abbott, with an introduction by poet Muriel Rukeyser. The only biography of Abbott in print, it covers all of her work through the 1980s. A new and improved edition, this book includes all of the photographs in Abbotts ten-year photo documentary of New York. More than 300 pictures are divided into regions with detailed maps and captions from the original research. Includes a lively essay by Yochelson about Abbotts New York work. The second updated edition of Abbotts Guide to Better Photography, this how-to manual is illustrated with photographs by Abbott and others. Includes a revealing chapter on composition, Abbott-style. An entertaining documentary film about Berenice Abbotts career, narrated by the artist. Abbotts essay written for a photo magazine detailing her views on both photography as art and documentary photography.